A few years ago, I thought there was only one kind of peanut butter. The only kind I knew was the one sold at regular supermarket, you know, just plain peanut butter. Who knew there were so many kinds of nut butters? So many flavors? I think there’s a butter for every nut. If there’s a nut, there’s a butter for it right? If you google nut butters, you’ll know what I mean about the variety that is available out there. I love to add peanut butter to my oatmeal, pancakes, toast & etc. because it adds healthy fat to my meal. Fat is good. My body likes healthy fat and helps keep hunger away. I loved it so much that I ordered it in bulked on Amazon (pack of 6). I saved money and shipping was free. So what do I do when the container is almost empty? When you can’t scrape any more of the peanut butters on the bottom? Enter Oats In A Jar (OIAJ). Love this trick. No peanut butter goes to waste. (I know that blog readers know what OIAJ is, but I’m introducing this trick to newbies). 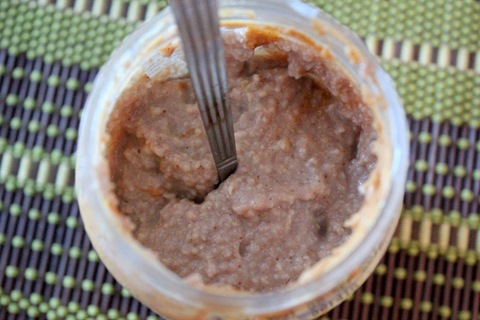 Put your cooked and warm oatmeal in the jar and you will be able to eat all the leftover peanut butter on the side of the container and everything on the bottom too. Scrape if you want, but it’s not necessary because the butter will melt into the oatmeal. No peanut butter left behind. Check out the nutritional stats below. Not too shabby. On days when I just want to be plain Jane and just eat a plain bowl of oats, this is the peanut butter that I eat it with. It’s creamy, it’s tasty and provides enough sweetener for my liking. P.S. I hope one day, that I will be able to dine at Peanut Butter & Co’s sandwich shop in NYC. It’s on my must-try list next time I visit the Big Apple. What is your favorite peanut butter? Have you ever done Oats In A Jar? My favorite pb is Dark Chocolate Dreams!!! 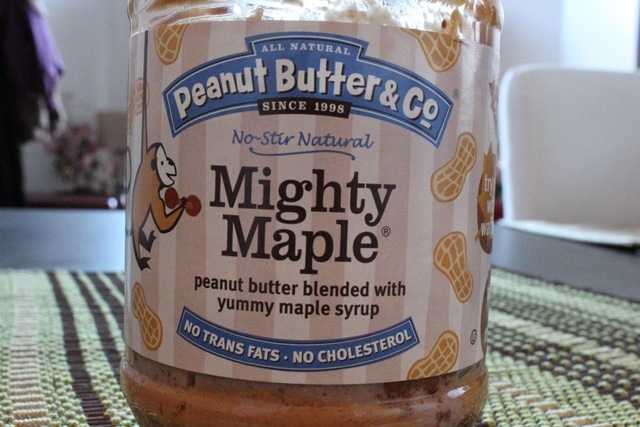 I’ve never tried Mighty Maple, though, and it sounds pretty tasty! I love the Dark Chocolate Dreams too, but I just don’t eat it as an every day PB like I do with the Mighty Maple. I totally want to go to the PB&Co restaurant and store. I REALLY want to try their the heat is on flavor. 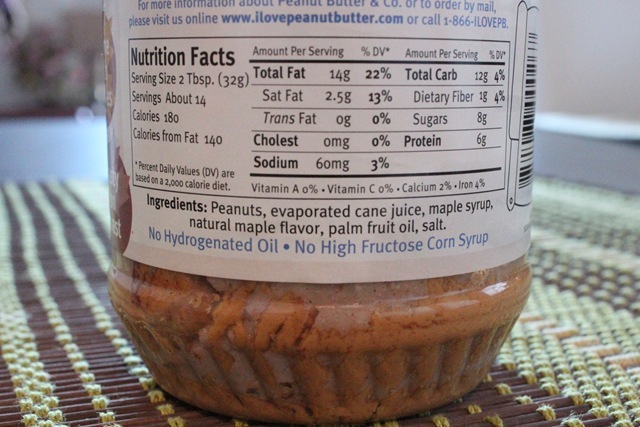 My current favorite PEANUT butter is naturally more. Maple makes my heart sing..good to know I can order on Amazon!!! I didn’t use to like PB in my oatmeal because I mixed it in the bowl (the taste gets lost), so I left the PB on the spoon and scoop the oatmeal with it on the spoon so that for each bite, you can taste of the PB. 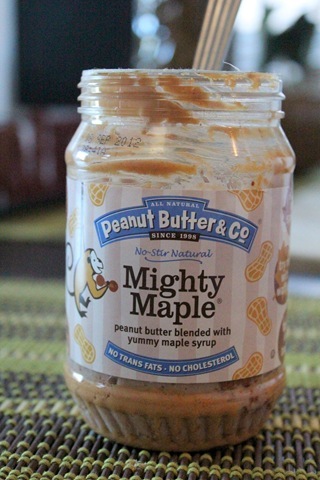 mighty maple IS my favorite PB ever. hands down. I JUST heard about this brand last week and I also have my sights set on visiting the NYC store. I figured I’d try some of the Dark Chocolate or White chocolate peanut butters next time I go to Whole Foods, but Amazon sounds like a much better idea! *Sigh*, I’m envious that you are going to NYC soon and also that you are going to visit the sandwich shop. Hope you tweet me when you are there. oh my gosh! How do I live and work in NYC and not know about this? I love OIAJ! The PB gets all melty and tastes so good. My favorite PB&Co. peanut butter is cinnamon raisin. I could eat a whole jar in a week! I’ve been to the PB&Co. store. It’s adorable and there are so many great options all involving peanut butter! I had a sandwich with cinnamon raisin PB, apple, and cream cheese. It was soooo good and very easy to recreate! I’m pretty sure I’m the only healthy living blogger that feels this way, but I don’t eat much nut butter. Usually I’d just get Trader Joe’s flaxseed one and use it with celery or on pb&j sandwiches–never in my oatmeal. Maple?!? I haven’t seen that one! My favorite, hands down, is Dark Chocolate Dreams. It’s out of this world. 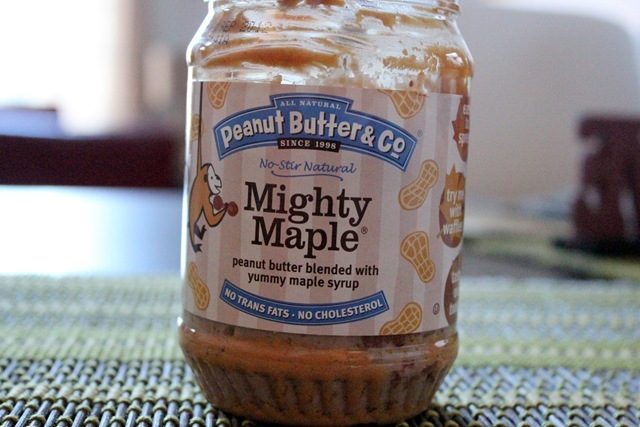 I love Dark Chocolate Dreams too, but for every day PB, I like Might Maple better. I think the reason you haven’t seen it is because when I looked, I didn’t see them around in the stores. Target has the White Chocolate and Dark Chocolate only. How can anyone go wrong with peanut butter I absolutely love just P&J. Regardless of my sensitivity to it it’s really not that bad it’s a complete meal. Yummy my favorite go to snack.